An uncommon location for this recent «villa» in neo–provencal style, within a very quiet domain between Saint-Raphael and Saint–Tropez. This villa of 230 m² with caretaker is surrounded by a beautiful garden (1900 m² planted with typical Mediterranean tree essences) and will let you enjoy magnificent see view. «La Pinède», a residence with plenty of charm and features offers 4 bedrooms king size (one of them is the master suite), an 80 m² living room with large windows opening on a gorgeous terrace of 110 m² allowing great convivial times with family or friends. A quiet and pleasant swimming pool of 11 x 5m is lovely integrated in the property overhanging one of the most beautiful places of the Côte d'Azur . The kitchen in Provencal style with all the modern comfort opens directly on the terrace. Beaches, shops and marina are only distant from 500 m and the thalasso therapy center is 200 m away. Two fire places with barbecues will allow you to enjoy grills in peaceful and charming surroundings. In front of the house a typical south of France place allows playing boules in joyful moments of detente. 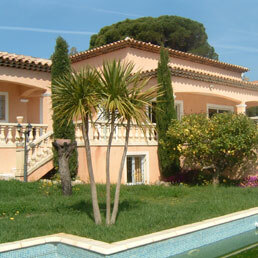 This villa is simply designed to offer you unforgettable holidays. Closed property with electric gate and videophone. All shutters are closed centrally. Car shelter for 2 cars.